Harrison – One of Canada’s top fiddle players, Pierre Schryer , will be coming to town to play with Harrison’s own, Andy Hillhouse. The show begins at 8:00pm with doors opening at 7:30pm. Tickets will be available online, by phone at 604.796.3664, or in person at the Ranger Station Art Gallery or Agassiz Shoppers Drugmart. Pierre Schryer is one of Canada’s leading traditional fiddlers. A recipient of numerous titles and awards including Canadian Open Fiddle Champion, Grand Masters Champion, Violoneux Championnat, and North American Irish Fiddle Champion, Pierre truly captivates an audience with his energy and genuine warmth. His ability knows no bounds, covering styles from Irish, Scottish, Québecois, and Cape Breton to Canadian Old Time, American Swing and more. As leader of his self-titled group, Pierre Schryer Band built an international reputation as one of Canada’s most well respected traditional music ensembles by touring throughout Canada, the USA, Ireland, Europe and the UK since the mid-90’s. Pierre has shared the stage with dozens of internationally renowned colleagues in the traditional music scene and has performed with numerous orchestras across Canada with his acclaimed Symphony Pops show. Of his six recordings released on his own label New Canadian Records,“Blue Drag” was nominated at the 2004 JUNO Awards for best Roots and Traditional (Group) Album of the Year, “Mélange” at the 2008 Canadian Folk Music Awards for Instrumental Solo Album of the Year, and “2 Worlds United”, a brilliant duo album with top Irish button accordionist Dermot Byrne, was distributed by Claddagh Records. Pierre’s talents extend beyond his musical abilities. An accomplished luthier and artist, he currently performs on one of his own violins and creates the cover art and design for his recordings. Pierre is the creator and artistic director of “Canadian Celtic Celebration”, a three-day June festival presented in Thunder Bay, Ontario for 16 years. Dedicated to passing on the tradition, Pierre teaches at numerous fiddle camps and is committed to creating community through traditional music sessions wherever he resides. Andy Hillhouse cut his teeth in the folk world as the founder and manager of the Celtic funk band Mad Pudding, who toured festivals and folk clubs in North America and Europe through the 1990s. Since 2000 he has provided driving, groovy guitar for several of the Celtic music scene’s most respected and exciting acoustic musicians, including west coast innovative fiddler Zavellennahh Huscroft, champion Canadian fiddler Pierre Schryer, Irish flute player Nuala Kennedy, and The McDades, with whom he won a JUNO and two Canadian Folk Music Awards in 2006. His recent album Passages (2017) contains a mixture of traditional and original songs, and songs by a few of his favourite writers. Andy obtained a PhD in Ethnomusicology from the University of Toronto in 2013, and he is currently the Executive and Artistic Director of the Harrison Festival of the Arts in Harrison Hot Springs. 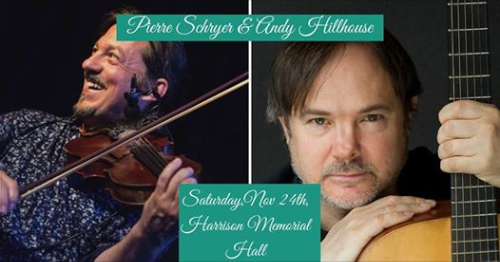 Be the first to comment on "Pierre Schryer & Andy Hillhouse In Concert November 24 At Harrison Memorial Hall (VIDEO)"